My first appointment with Dr. Wendy was made to address andropause symptoms that I felt I had been experiencing/suffering through for roughly 1 year. My primary physician had prescribed antidepressants for me which I did take for several months and experienced a worsening of my depression instead of relief. My first visit to Dr Wendy she ordered a comprehensive blood test for me and used acupuncture to treat my andropause symptoms as well as to help me quit a 30 yr old cigarette habit. Once blood results were obtained she addressed each problem area via vitamin supplementation and bio-identical hormone supplementation and acupuncture. This approach really helped alleviate my andropause symptoms. In December of 2009, I was diagnosed with Ulcerative Colitis and prescribed by a gastroenterologist three pharmaceutical formulations which were supposed to keep this condition under control. I was informed that there was no known cure for U.C. and if the inflammation it causes wasn't addressed I would be at a much higher risk for colon cancer than the general public. The meds given me for the U.C. weren't effective for me and I was told that I would have to switch to infusion therapy to control the symptoms and internal bleeding that I was enduring. If this treatment wasn't effective I was told that I would have to have my colon removed to lessen my odds of getting that cancer. After researching the infusion procedure and the numerous adverse conditions that it can cause such as lymphoma, depressed immune system and really too many others to list. I turned to Dr Wendy and asked her if she could help me. She suggested boosting my immune system and prescribed a combination of higher levels of vitamin D, physiological supplementation with Cortef (hydrocortisone) for adrenal hormone deficiency proved by test, iodine supplementation and using the amino acid L-Glutamine as this is being used by some gastroenterologist to help heal the gut. She ordered periodic blood testing to assure that supplementation was at optimal levels. I'm at least 90-95% better under her care for U.C than I was under more traditional care and while I was taking the pharmaceutical meds. My colonoscope done last months showed 95% improvement with only small effected areas. In my mind, what really sets her apart from more traditional physicians is that she will really listen to your concerns and encourages her patients to perform research themselves and will consider utilizing findings that you come up with if they are based on medically sound principals and/or have been shown to be effective in clinical studies. She also is always attending scientific courses/seminars and becoming knowledgeable in anti-aging practices that are on the cutting edge of medicine and then utilizes what she learns to benefit her patients. In closing, I fully recommend her to anyone that is unsatisfied with the traditional care being offered to them. She truly does a wonderful job incorporating traditional and holistic care. The acupuncture needles do not hurt as much as regular needles because they are thin, flexible and not hollow inside the needle, so they don't traumatize the tissue as much as the regular needles. My practice only use the best high-tech disposable acupuncture needles which were sterilized stainless steel needles for your comfort. What should I expect when I come in for an initial visit? The treatment plan usually consists of nutritional education, supplements, lifestyle changes, and acupuncture. You will be given a reading list to increase your knowledge about the holistic health approach. Most patients benefited so much from the books that they shared them with their friends after reading them. There may be several supplements since Dr. Huang prefers not to use medications, so she uses food and supplements as her medicine. What should I expect after the first visit? Dr. Huang will usually ask you to start your supplements right after the lab tests so your body can start healing. You can make a follow-up appointment 2 weeks after the tests are done. You do not have to call to check whether Dr. Huang has the lab results. Dr. Huang has her computer connected directly to the Quest and Labcorp databases, so she will have results as soon as the tests are done. Regular lab tests will be done within 7-10 days, so she will always have lab results in 2 weeks. The most important thing is to incorporate all the nutritional and lifestyle change she suggested and take the supplements as directed. Many patients will feel somewhat better by the time they come in for follow up if they follow their program seriously. The first follow up visit will be very interesting and informative when Dr. Huang goes over the results with you. She will make further suggestions after reviewing the lab work. She will also outline the future treatment plan and frequency of your future visits. How does ear acupuncture work? There are many microsystems in our body like our ears, feet, tongue and scalp. Man is considered a microcosm that expresses the harmony of natural order in the macrocosm, and reflex microsystems on man's surface recapitulate the body macrocosm in holographic form. That is, treating a particular point of our ears will generate specific healing powers in our body. Auricular acupuncture was founded in China but really scientifically perfected by French physicians after their missionaries acquired the skill from Asia more than two hundred years ago. Almost every tiny area of our ears was scientifically mapped to reflect a particular body part. What are the differences between the needles and the seeds for auricular acupuncture? 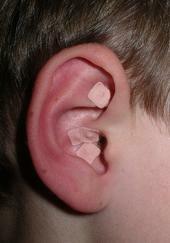 The needles are more effective at the spot, but the seeds can be left on the ear for up to 3-5 days. By gently rubbing the seeds 3-4 times a day, you can provide continuous stimulation to heal the body. Also, the seeds do not penetrate the skin so they don't hurt at all. Where can I get more information about medical acupuncture? An Overview Of Medical Acupuncture, by Joseph M Helms, M.D.